Despite that I spent the better part of three days interviewing and shadowing Irwin Jacobs for a Powerboat magazine feature in the early 2000s, I didn’t really know him. For an extended weekend at his home-base in Minneapolis, I asked Jacobs, then the head of Genmar Holdings, LLC—the parent company of Wellcraft, Ranger, Scarab, Hatteras Yachts, Glastron and more—a whole lot of questions and followed him around. But knowing a person takes much more than that. Jacobs died horrifically and tragically last week. He reportedly took his own life after killing his wife, Alexandra, of many years. Mrs. Jacobs reportedly had significant health issues and the crime has been labeled a murder-suicide involving firearms. Mr. Jacobs was 77 years old. 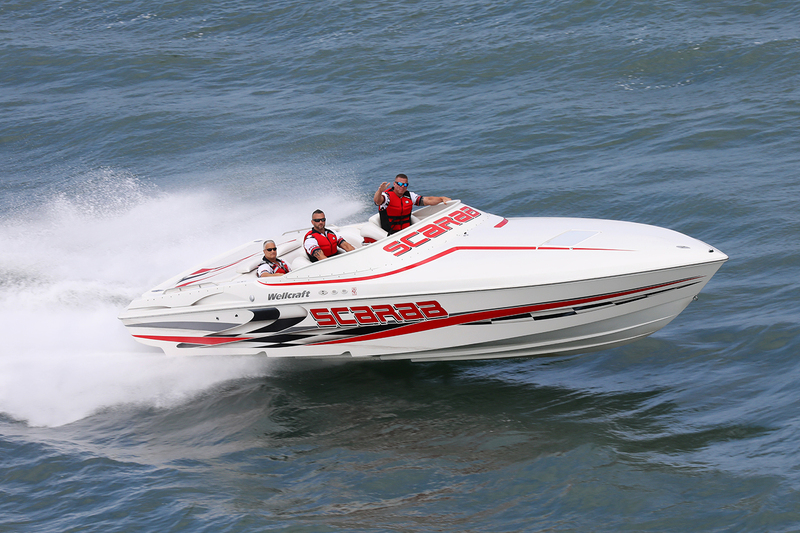 Once a popular go-fast powerboat brand, Scarab eventually was eliminated from the Wellcraft line during Jacobs’ ownership of the company. Photo by Jeff Helmkamp/Helmkamp Photos. A heavy-hitter on Wall Street in the 1980s who became one of the wealthiest men in the country —from 1986 to 1988 he was on the Forbes 400 Richest Americans list and at one time he was a minority owner of the Minnesota Vikings NFL franchise—Jacobs towered over me in his fine double-breasted suit. And I’m six feet tall. That, plus his widespread reputation for having a short fuse and little use for reporters, made me nervous. Sitting across from him at the massive wooden desk in his more-massive office, I began to think the whole idea of an Irwin Jacobs magazine profile was a big mistake. He was going to chew me up and spit me out, and I was going to head home to Southern California without anything useable. I could not have been more wrong. As expected, Jacobs was brash and loaded with bravado. But he was also engaging. He was more charming than intimidating. Never one to shy away from conflict, Jacobs became the bane of the personal watercraft industry in the late 1990s and early 2000s with his relentless contention that its products were driving other powerboat owners off the water. Though he stated that notion as fact based on Genmar “research,” which he declined to share with me, I learned that his connection to it was personal. According to Jacobs, a couple of personal watercraft riders had terrorized him and his daughter, Sheila, when they were fishing on Lake Minnetonka one day. That part of our interview got testy. I asked to see the data supporting his contention that personal watercraft were hurting the marine industry. He had zero interest in sharing that data with me. I questioned its existence and the conclusion he based on it, and our interview ended. But that was our sole rough patch. The following day, we discussed his passion for bass fishing and his belief that the then-called FLW Tour (named for Ranger boats founder Forest L. Wood) would become the next NASCAR—he even showed me renderings of bass boats dressed in existing NASCAR livery. He also told me about his idea for a new, all-Scarab V-bottom spec-class offshore racing series. Offshore racing was at its early 2000 zenith. Jacobs believed it might hold the keys to the survival of the Scarab brand, which he scuttled a couple of years later. Early the following evening, I caught a ride with him to a support-group meeting for parents of mentally and physically challenged children. Jacobs knew the subject firsthand, as his daughter, Sheila, had faced such challenges throughout her life and was living in a group home for adults with many of the same issues. Jacobs spoke to the parent group about the challenges they all faced. He told them it was imperative they advocate for their children, because no one was going to do it for them. Beyond that, I don’t remember exactly what he said. I do remember it was message of reality-based support and empowerment. And I remember thinking that while having lots of money certainly makes it easier to cope with some of life’s greater challenges, it does not eliminate them. Near the end of our final interview the following morning, I asked him if there was any secret to his considerable business success. His answer was simple—and one I’ve never forgotten. “Find a need and fill it,” he said. Irwin Jacobs wasn’t just big man with a big personality and even bigger money. He was larger than life. He also apparently was a lot darker and more troubled than most people knew. But then, like many people I suspect, I never really knew him.